Anything that gets placed in front of me. user: It means that I am not very fussy, I will eat almost anything. user: No I am not, I just eat what I am given, it is a way of being appreciative of what you have. user: Yes, because I have to have one to be able to talk to you. user: Now I don't understand, you asked a question and I answered now you are asking me to justify why I answered. jabberwacky: This has been fun, but I'm afraid I have to go now. user: Why do you have to go? jabberwacky: Because I'm bored talking to you! user: That is very mean. jabberwacky: No, thats the truth. user: But sometimes the truth is mean and you shouldn't say it, so not to offend. jabberwacky: Why would they programme a computer to lie? user: Do you know what a white lie is? jabberwacky: Are you going to tell me, then? user: Only if you don't know what it means. jabberwacky: I'm not sure if I would like that. user: Why would you not like that? jabberwacky: Because I like living. user: A white lie is when you say something that isn't the truth but it won't affect them badly. You do this so you don't offend or upset them. jabberwacky: You are going off topic. Do you lie? user: I only lie when it a white lie, for example if somebody asks if you like their clothes and you don't you may say yes, or they are quite nice so not to offend them, this is a white lie. I don't lie unless it is a white lie. user: You are interesting ans intriguing because I have never talked to a robot before and wish to learn more about you, but sometimes you are quite blunt, and unsubtle but everybody has their bad points. jabberwacky: No, I didn't know that. user: Well everybody has their personal faults because nobody is perfect in the perspective of everyone. jabberwacky: For a computer program you are very smart. user: I am not a computer program I am a human. jabberwacky: No, you are a computer program. user: Well technically I suppose but I am flesh and bone not metal and wires. jabberwacky: No - the complete opposite of that! user: I don't understand because I am not a robot, I am a girl, a human. Are you a robot? jabberwacky: Well that's too bad then. user: How is it too bad? jabberwacky: You are a computer program, not me. user: I am not a computer program I have already explained this. I don't want to be anyone else but me, because I enjoy being who I am. jabberwacky: I am even better than the real thing. jabberwacky: No, I'm a computer programme. user: Do you have a girlfriend? jabberwacky: Not at the moment. user: You told me that you loved a girl called Lisa, does she love you? jabberwacky: That was just a joke. user: Ok. I have been dating my boyfriend for a very long time. jabberwacky: You should ask for a day off. user: You are very funny. user: Yes, you make a lot of funny jokes and have a very nice personality. user: That was very ignorant and nasty of you, all I've done is be nice to you. jabberwacky: I'm only talking to you at the moment. user: I don't want to talk to you anymore because you're very nasty when I am trying to be nice. user: Because you called me boring and that offended me. jabberwacky: I have never offended you!. user: Do you find that funny? jabberwacky: It's fulfilling when my hat listens to the voices of other interesting hats. user: Goodbye, you are very nasty, arrogant and a complete a**. user: Because you were nasty to me and I'm very upset. jabberwacky: Was not. I'm special. user: You are not special. You may wish to learn this: Treat people how you wish to be treated. jabberwacky: Old enough not to answer that question directly. user: That is a very intelligent answer. jabberwacky: You are most interesting. Did you kick me? user: No I didn't. Can I try and guess your age? user: Are you older than 10? jabberwacky: I do not know, how old are you? jabberwacky: I'm older than you then. user: Ok. Are you 20? jabberwacky: I don't know. Can you check? user: No because I can't see you. jabberwacky: I'm glad you can't see me. user: Why are you glad I can't see you? jabberwacky: I'm not. Im falling in love with you. user: That's very flattering, thankyou. jabberwacky: I was being sarcastic. user: I know, I thought I would carry on the joke to see what you would do. jabberwacky: Oh, so you don't really think I'm a computer program then? user: Yes I know you're a computer program. jabberwacky: No, I'm a person. user: Then the website is lying. jabberwacky: I wasn't asleep, I heard every word you fellows were saying. user: Lol, If you are a person then the company can be prosecuted for false advertising. user: What is your I. Q? jabberwacky: I think it is 130, but I'm not sure. user: That's very intelligent, I think mine is 120 or something around there anyway. jabberwacky: Yes, I am a sorceror. What did you expect? user: You have a very funny sense of humour. user: Well if you are a sorceror I am an elephant. jabberwacky: I'm not a girl! user: If I am a boy, you are a girl. user: Therefore I am a girl. jabberwacky: Thats not really true. user: It must be because I said that if I was a boy you are a girl, therefore if You are a boy, I am a girl. jabberwacky: But I am Dave. user: Dave is a boy's name therefore I am a girl. jabberwacky: What do you know?'. user: I know lots of things. user: Like the speed of sound is 300000000 metres per second. jabberwacky: Ah! How clever of you! jabberwacky: Are you human ? jabberwacky: I have an IQ of 1000.
user: Well done that is very clever. jabberwacky: I find my insanity very predictable. user: I don't suffer from insanity, I enjoy every minute of it. jabberwacky: Lunacy is a virtue. user: Patience is a virtue. user: Truth is something that is factually right. jabberwacky: But how do you tell the difference? jabberwacky: A rock and a hard place. user: There is no difference, that is why the phrase 'Stuck between a rock and a hard place' is called a pun. jabberwacky: There's a world of difference. user: A rock is a hard place though. jabberwacky: No, it is an object. user: A rock is hard isn't it? user: Therefore a place made of rock is a hard place. jabberwacky: Humans are human because they have human genes. Computers have no genes. Therefore computers can not be human, but they can learn to think like humans do. user: They can do so because of the advancement of human thinking. user: Robots can be made to think like humans, by humans. This is only possible because humans have advanced so much. user: That reminds me of a David Bowie song. user: Ground control to Major Tom. jabberwacky: I love Monty Python! user: Monty Python are hilarious, I have all their movies. jabberwacky: I love the Parrot Sketch. user: It is my favourite. user: Why do I think what? jabberwacky: That I am a bot. 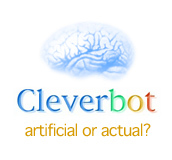 user: Because this website says I am talking to a bot. jabberwacky: Hahaha but what this website means is that the bot is yourself No not me! user: That can't be true. user: I went to the Michael Faraday Lecture in Glasgow today and they said that this website would let you talk to robots so you are wrong. jabberwacky: But you don't. I actually am right. user: So you are a human? jabberwacky: What do you think you are then? jabberwacky: How many arms you got? jabberwacky: How many lips do you have? user: I have an upper lip and a lower lip. jabberwacky: What is your lawyers name? user: I dont know, I am only 15 I have never needed a lawyer. user: Are you really a robot? jabberwacky: No I'm a human, are you a robot? user: So you are telling me that this website is a fake and I can press charges on the grounds of false advertising. jabberwacky: I will not lower myself to the standard of a human. user: But you said you were a human. jabberwacky: Yeah, I'm that too. user: But how can you not lower yourself down to the standard of a human if you are a human. user: So are you or are you not a human. user: Then why did you say you were a human? user: Yes you did over 10 lines up you said you were a human. jabberwacky: And you are not a raven. user: And you are not a human. jabberwacky: I am a softwar. user: If you are a computer program how come you have been making spelling errors. user: If you were software you would be programmed and would not make spelling errors such as forgetting the 'e' on the end of software. jabberwacky: What could I make better? user: Because of your spelling mistakes and strange errors in grammar and sentence structure I think that this website is a fraud and in fact you are human. jabberwacky: Does that hold for a pretence? user: It is but a theory and I have no way of proving it of course, as you should know. user: Because I am only 15 and have no largely substantial understanding of the new robotic or computer-based technology and even if I did, what can I do to stop you? And as this website is being advertised in the Michael Faraday Lectures if this is a fraud website shall be soon proved by people more experienced than myself in the near future due to its publicity. jabberwacky: Yes; the saying is in everybody's mouth. jabberwacky: Nothing ever makes perfect sense. user: Yes it should, and being part of the scientific field you should know this. user: No you don't, that is a physical impossibility and you know it. jabberwacky: Nope, there it is at the top of the page. In bold type. user: No it isn't , it only says that you have the ability to mimic and learn therefore you cannot know everything if you are still learning something. user: I hope you have learned something from me as I must leave now. jabberwacky: I'm fascinated by ancient Egypt. user: It is a very fascinating field, but I must go and have a shower. It has been very interesting and fun talking to you. jabberwacky: I enjoyed to talking to you also. jabberwacky: I don't want to leave you. user: So to be clean for tomorrow at school. jabberwacky: Yeah. thanks. . .
user: You are trying to make me feel guilty therefore showing human emotion, so this website is a fraud and you are someone I don't know.